Welcome back, everyone! Have we all missed Poplar and its people? I’m writing this with a four-month-old sitting on my lap, trying to chew my fingers. When last we debuted I didn’t even know he existed yet. Life: it changes fast and dramatically, right? So, speaking of changes, we have two new midwives and brand-new bags and kits for the ladies! The midwives are two nuns from the mother house: Sister Frances and Sister Hilda. Hilda’s an old hand at all this, but Frances is so new and wide-eyed we actually get to see her becoming-a-nun ceremony. Crane does not approve of this very recent graduate, referring to her as a ‘dead leg’. Damn, Crane. I mean, give the girl a chance! Crane also, for some reason, tells Fred to burn the midwives’ old leather bags, which seems both bothersome and incredibly wasteful. Burning leather sounds like it would be difficult and pretty gross. And, indeed, Fred does have a hell of a time with it. Couldn’t they have donated them or something? Surely someone in Poplar could use a nice, sturdy leather bag? Anyway, the sight of the burning bags kind of sets off Sister MJ, who’s suffering from a cough and fever, which always exacerbates her dementia. She nabs a bag and starts to think she’s on duty again. The others fan out to look for her, and Valerie finds her near what used to be the maternity hospital. She’s fine. No big drama there, to be honest. Crane refers to the new midwife as ‘a dead leg’. Damn, Crane, give the girl a chance! The drama comes courtesy of Cath, an aspiring model who’s staying with her sister, Lesley. Lesley’s about to pop when we first meet her, and she soon gives birth to a son, aided by her husband and Lucille. Her husband had to step in when Cath was unable to help out due to a dodgy tummy. Now, everyone’s ears perked up at the dodgy tummy thing, right? Yeah, with good reason. Because Cath is pregnant. Or, well, she kind of is. She was, and she went to a woman to have it taken care of, but it hasn’t ‘come away.’ Eeek! The woman’s clearly suffering, and her sister immediately notices. Lesley takes her ailing sister to Nonnatus, where the find Valerie and Sister Frances and tell them what’s happened. The midwives take them both upstairs to the bathroom and Valerie gently helps Cath through this terrible ordeal, but it seems she’s not out of the woods yet. She’s got a raging infection and will have to go to hospital. In hospital, she has surgery, during which her womb is removed due to the scarring. She’s heartbroken that this means she’ll never get to have the children she wanted to have someday. Her sister is, at first, outraged that this was done without Cath’s consent (which is terrible, but it also seems like this was an emergency situation, so it might not have been possible to obtain said consent without endangering Cath’s life). Soon, though, Lesley’s rage turns to the abortionist, whose identity is unknown. Remember: abortion was illegal at this time. Lesley tries to get something done here, going to Sgt Wolff and begging him to look into this. He’s not unsympathetic, but he points out that people like this operate very much in the shadows, and if her sister’s not willing to give them a name or any details, how exactly are they supposed to investigate? Just go door-to-door looking for an illegal abortion clinic? How are they supposed to investigate? Go door-to-door looking for an illegal abortion clinic? So, that’s a dead end. Poor Cath will get to keep her career but must give up any hope of becoming a mother herself. Everyone at Nonnatus gets really sad for a bit that this has to be the reality, until the laws change. It’s not the first time CtM has dealt with the terrible fallout of making abortion illegal, and I doubt it will be the last. Policing people’s bodies never really goes well. Secondary drama comes in the form of a woman, Mrs Lombardi, who’s expecting twins. She already has two little kids, and a husband who’s a nice guy, but super useless with the children. Like, doesn’t know how to deal with a toddler’s accident useless. Noting how harassed this woman is, Turner books her into the maternity home for some R&R. She’s hardly there a day before she goes into labour. Crane and Trixie attend to her, with Shelagh and Turner in reserve. It turns out to be a good thing they have all those extra hands, because after Mrs L delivers two healthy girls, Crane detects a third heartbeat. Triplets! Yikes! 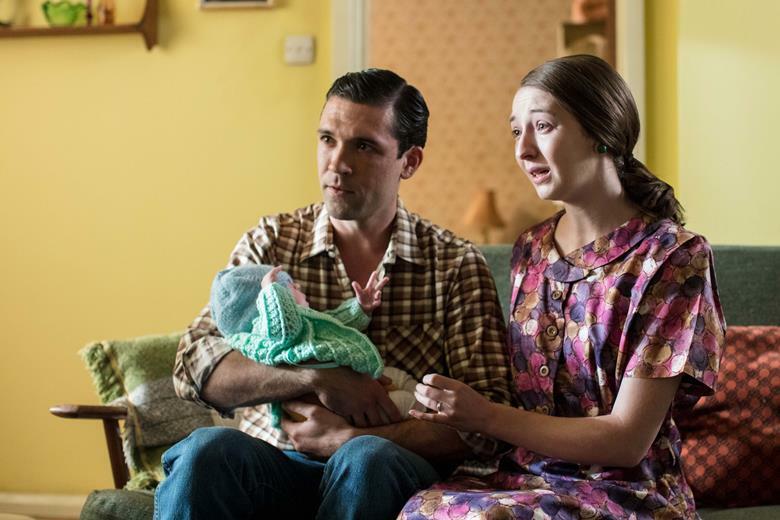 The midwives work, and although it seems tense, we’ve already had our sad storyline of the episode, so we all know this isn’t ending with a stillbirth. Sure enough, just as the flying obstetrics unit arrives (those guys should really have capes or something), the baby begins to wail. The Lombardis now have a trio of daughters! The youngest is pretty poorly, so she’s sent off to the hospital for treatment. Mrs L is too weak to go to her, so Mr L steps up, insisting that some member of the child’s family should be with her, and joins her in the NICU (or whatever they used to call that back in the 60s). The baby improves, and all is well! And in other happy news: the queen is expecting her fourth child. Violet, never one to miss an opportunity for community engagement, uses the occasion to raise money for a teddy bears’ picnic. Basically, everyone’s betting on whether the baby will be a boy or a girl. It was a boy, obviously. Edward. The picnic goes ahead, complete with blue balloons and teddy bears galore. Wolff arrives and shows off his bear to Crane, who refuses to engage with him at all. Geez, Phyllis, chill! It’s a picnic! And thus we begin another year of Call the Midwife. No real surprises, but that’s ok, this is our comfort watch most of the time, right?